Try the Best Project Software Online Totally Free Here! Do We Have the Best Project Software? Knowing how many choices are available for project managers, coordinators, team members, groups, communities, and individuals, it's flattering to hear our users use words such as best, greatest, and superior when they discuss TeamWork Live. We may not have the best project software out there, but our users sure think we do! What makes for great project management software anyway? Unlike most project software or software in general, TeamWork Live allows you to quickly and easily import your project from other tools, such as Basecamp, and to do so in minutes. We don't want you to feel trapped so we have built our system to be a flexible, data-driven solution that allows for elasticity and transferability. We know you'll love our features and are proud to offer a service that gives you control of your data and how you would prefer to use access and use it. The best project software make it easy for you to juggle all your existing projects and start new ones without creating a lot of extra work for yourself. TeamWork Live does the former by handling the repetitive project management work for you so you have more time to concentrate on the more important stuff. We will automatically remind you when tasks are due, budgets are exceeded, or changes are made to a project. We also make it easy for you to get on the same page with your project members through a personalized dashboard with a real-time view of project activity and a daily email digest summarizing the progress made each day. For the latter, TeamWork Live makes it easy for you to start new projects by allowing you to create project templates for your most frequently used projects and reuse them for future projects. Once your project template has been set up (you only have to do it once! ), you no longer have to waste time duplicating work to get your project started. Instead, you can simply duplicate your project template and be on your way. 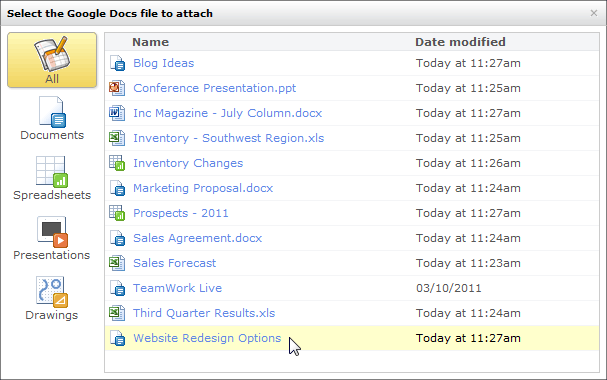 Project templates are the cornerstone and possibly the main reason other PM software users choose us. Sure, it's great that we have included integration for Microsoft Project, broke the mold by allowing for Google Docs integration, but what makes us a really great solution is the fact that we've built our online project software to scale. The elasticity of the TeamWork Live platform gives us the ability to add integration for whatever cool new technologies enter the marketplace (and typically very quickly). Google Docs is commonly used for collaboration between teams for building spreadsheets, collaborating on a document that can be exported to dozens of formats, and is essential for many day-to-day project tasks (particularly active tracking spreadsheets). Thanks to the hard work of our developers, we've built a way for your project team to continue using Google Docs in your day-to-day work, while maintaining a project management system with milestones, tasks, events, messages, and document tracking all in one place. A hang-up many developers have with project management system is the "extra step" that takes them away from focusing on the tasks at hand. Thanks to the simple system we've engineered, developers can stay focused on their work and reply to messages with their default mail client and not have to login and logout of our project management system. Once you kick off a message, the recipient can reply via email, thereby updating the message or task notes without ever having to login to the system. Measuring time spent on a specific task or set of tasks and weighing that time against estimates is crucial to staying under budget and estimating future projects. TeamWork Live offers the ability to easily track time and manage activities organized under milestones. Compare time spent to estimates in seconds. Export data to help improve efficiency and effectiveness of tasks and resources like never before with what might be the absolute best project software on the Web today: TeamWork Live. Start your free trial below and tell us what you think. Are we the best? If not, tell us what you'd like to see improved by emailing us at support@teamworklive.com. You can be sure that your feedback will be used to make TeamWork Live even better.